Chewed for their digestive, tonic and aphrodisiac properties, Kola nuts have been an integral part of western and central African life for thousands of years. Kola nuts are used in huge quantities today to flavour soft drinks. It was traditionally was also used to stimulate digestion and strengthen a weak heart. 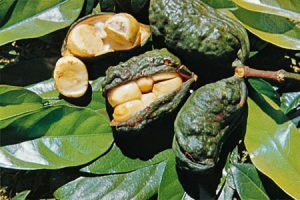 Kola Nut was used to improve concentration and clarity and decrease drowsiness. When used in excess though, the affeine content can contribute to agitation and scattered thoughts. The nut has also been used for coughs and asthma. 2.5% caffeine (generally higher than coffee), theobromine, tannins, phlobaphene and anthocyanin. Should be avoided in caes of hyperacidity and peptic ulcer. Can increase blood pressure when used regularly. Excessive doses can cause nervousness, excitability, insomnia and an increased heart rate.